Several companies operate in the global cyber weapon market, among which The Boeing Company, Lockheed Martin Corporation, General Dynamics Corporation, Raytheon Company, BAE Systems plc, and Northrop Grumman Corporation are identified as the key players in a report by Transparency Market Research (TMR). The defensive cyber weapon segment in the market is highly fragmented due to the existence of numerous companies offering high-tech cyber-security services. Contrary to this, only a handful of companies such as Hacking Team and VUPEN Security offer offensive cyber weapons. This has in turn resulted into a consolidated vendor landscape in the offensive cyber weapon segment. According to TMR, the global cyber weapon market stood at US$390 bn in 2014. Rising at a CAGR of 4.4% CAGR, the market is expected to reach US$521.87 bn by the end of 2021. With a share of 73.8%, the defensive cyber weapon segment dominated the market by type in 2014. Regionally, North America accounted for the leading share of 36% in the global market in 2014. “Besides exploring strategic collaborations and partnerships, the leading companies in the market are investing in the research and development of advanced solutions,” said a lead TMR analyst. Many of these companies are planning to expand their geographical footprint by expanding their existing product portfolio. The incidence of cybercrimes, security breaches, and data thefts has been rising at a significant pace. Compelled by this, organizations around the world have increased their investment to identify zero-day vulnerabilities. The existence of a hole in software that is not known to developer becomes an uncorrected software application vulnerability that could be exploited to affect consumer programs, data, and network. Identification of these vulnerabilities are important to prevent extremist groups from using them. Governments, intelligence agencies, and other organizations have spiked their investment to identify zero-day exploits and use them against enemy networks when necessary. With an aim of capitalizing on the prevalent trend, several traditional arms manufacturing companies are expanding their businesses in the cyber security segment. This will in turn fuel the development of cyber weapons. The market is also expected to gain from the increasing demand for security across critical infrastructure and utilities. Cyber weapons can launch attacks against critical infrastructure and disrupt vital services of an economy. Primary economic sectors therefore attach utmost importance to intellectual property and information and technology. This is a prime factor fuelling demand from the cyber weapon market. “The results of unregulated usage of cyber weapons could prove fatal. Several international organizations have thus described cyber weapons as malicious codes, which were used for mass destruction,” said a TMR analyst. Furthermore, they are also increasingly focusing on keeping these weapons out of reach of cyber-terrorists and extremist groups. Governments around the world are therefore compelled to implement stringent regulations to ensure non-proliferation of cyber weapons. Such regulations can impede the market’s trajectory to an extent. Nevertheless, the emergence of cyberspace as a new domain will fuel the uptake of cyber weapons in the forthcoming years. The increasing demand for technologies to safeguard national critical infrastructure, which primarily includes the communication network, industrial control systems, defense, and banking and finance, will also boost the sales of cyber weapons in the near future. Offensive cyber weapon segment of the market exhibits a consolidated vendor landscape. 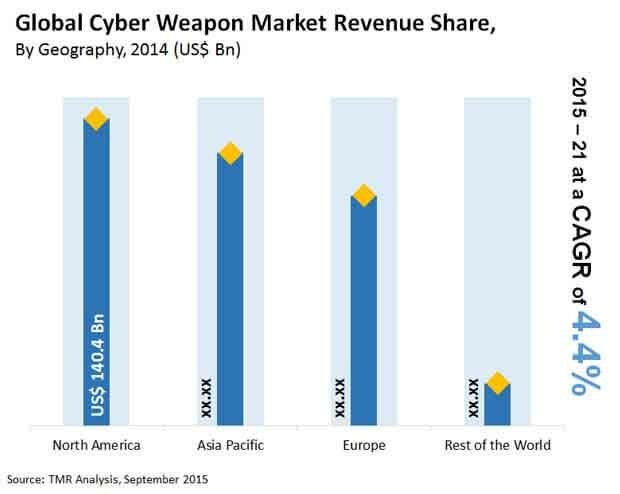 Defensive cyber weapon segment led the market in 2014 with a share of 8%. Holding over 36% of the global market, North America emerged as the dominant region in 2014.